All through the southern portion of the White Mountains I’d had decent weather and had gotten better views than I had ever had before. I knew that it was too good to last, but I enjoyed every second of it. Severe. Severe definitely wasn’t the forecast that I was looking for. With the forecast and the cloud in mind I decided that hiking with a buddy and getting down off of the ridges before the afternoon thunderstorms arrived was a good plan. 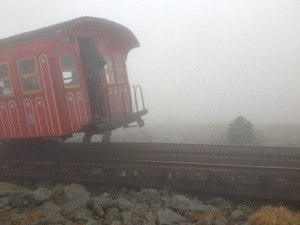 As we climbed Mt Washington the visibility got worse and worse until it dropped to about 10 ft and the wind speeds increased, easily reaching 45 miles an hour. We didn’t realize that we were at the summit until we were within 10 ft of the first summit building. 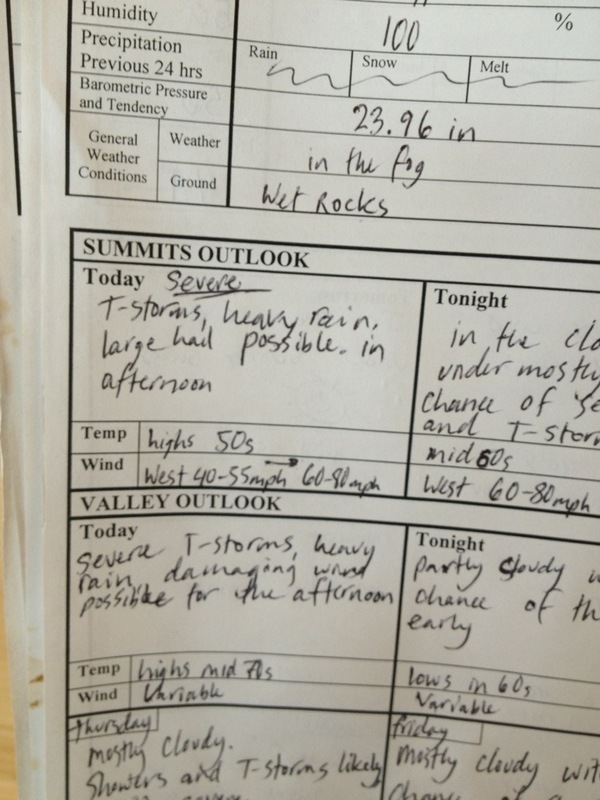 We battled our way through 60-65 mph winds to the observation building, excited by the idea of being somewhere warm. Other than the caretaker we were the only ones there. We warmed up for a few minutes and studied the radar. There was definitely a massive storm coming, but it looked to be five or so hours away. Beerdra and I talked it over and decided that utilizing our buddy system we were comfortable traversing the ridge from Washington to Madison. The guy at the summit agreed that if we left soon, and together we should be all set to get to Madison. The visibility was really bad and he noted that people sometimes get lost on the ridge. He then asked us if we had whistles. When we said no, he fished some fluorescent orange ones out of his desk and gave them to us before sending us on our way. We slowly made our way through the wind, the rain, and the fog across the ridge. Suddenly we heard a constant whirring/rumbling off to our right. Beerdra thought that maybe it was an alien spaceship coming to take us away, or perhaps machinery associated with the observatory. 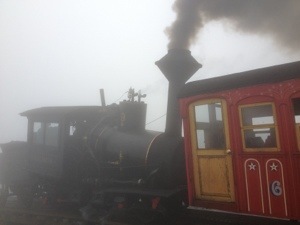 Suddenly train tracks materialized in the fog in front of us. The sound stayed the same, and I wondered how close the train would have to get for us to be able to see it. I decided to wait to cross the tracks until I figured out if the train was getting closer to us, or further away. It was a good thing we waited because the train materialized out of the fog right in front of us before we had any sense of its imminent approach. The passengers in the train waved to us as they went by. Somehow the train and its passengers didn’t quite seem real to us as we contemplated its mysterious appearance and disappearance. At least we knew what direction the train was headed now, so we could safely scramble up and over the tracks. 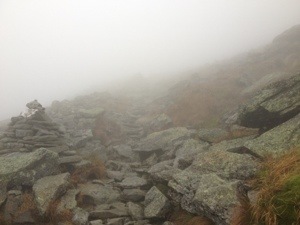 It was slow going across the ridge as we searched for the cairns marking the trail ahead of us in the fog, and tried to figure out the best footing on the wet slippery boulders they called trail. Suddenly the wind driven rain started to sting more than it had been before. I looked around and noticed that the rain was bouncing off of the rocks. It dawned on me… Rain doesn’t bounce like that, hail does. I turned my back into the wind/hail and tried to fix my hood to protect my face a little bit better. I’d come to expect this kind of treatment from Mt Washington. I explained to Beerdra that she would have felt let down if she’d come to the place with the worst weather in the world and hadn’t gotten to experience any of it. She said something in reply, but a gust of 65 mph wind buffeted us and I didn’t hear it. It’s possible that that gust of wind saved my life as we both had to fight against it to stay standing and it made it impossible for her to lunge at me *grin*. I was kind of enjoying the gusty winds and fog. As long as I had a buddy and there was no rumbling thunder in the distance I wasn’t worried about our safety. It also helped that we were headed someplace warm and dry that served hot food. 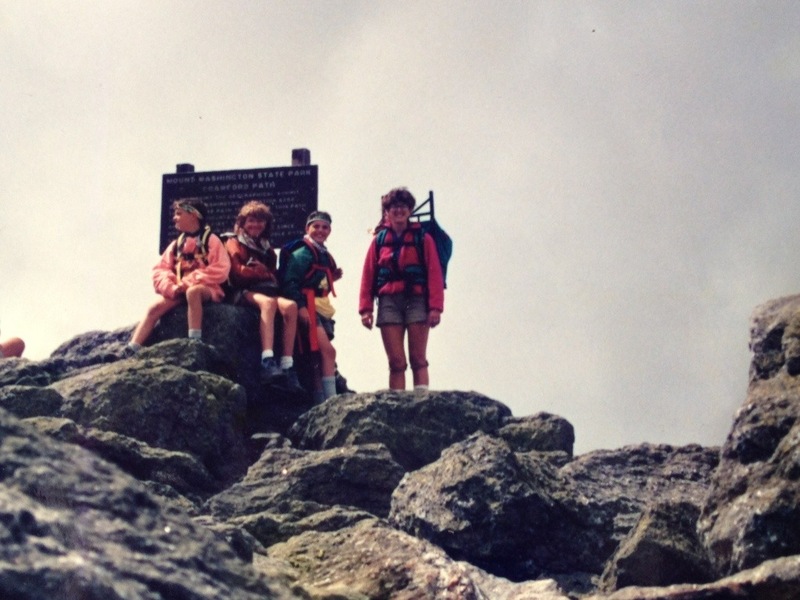 We eventually made it to Madison hut, where we spent the night to avoid the severe thunderstorm. 29 people had reservations for the hut that night, but only 6 people braved the nasty weather and showed up. The next morning the winds persisted, but we got marvelously warm weather and could look back and see Mt Washington in all of its glory. Despite its beastly nature, it was stunningly beautiful. 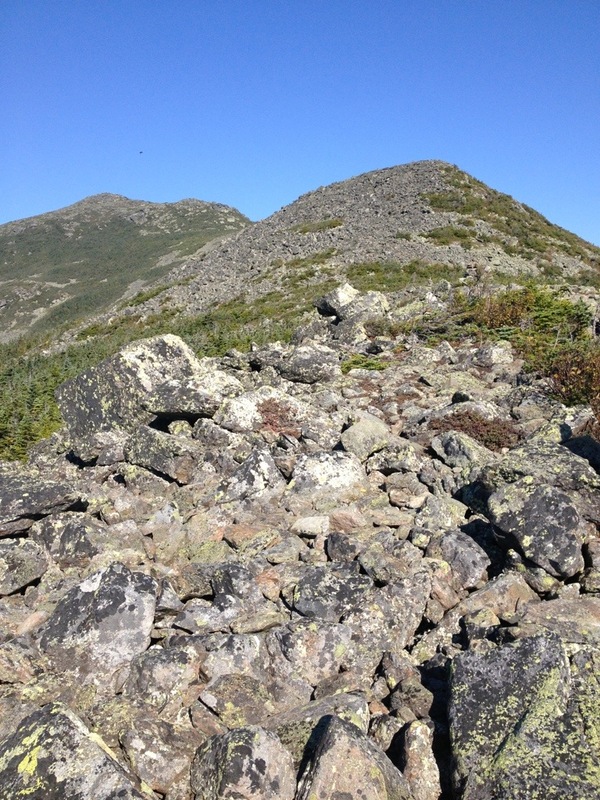 The hike over Madison was beautiful, even though it is a great big pile of schist. 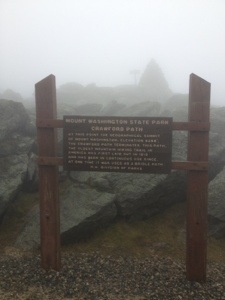 This entry was posted in Appalachian Trail and tagged hail, New Hampshire, rain, the White Mountains, weather. Bookmark the permalink.